The Allen County Public Library will issue a library card to applicants as follows. Adult card holders must be 18 or older and must present a photo ID at time of application with a piece of mail that has been delivered to the individual’s home address, addressed to the individual requesting a library card. Children under age 16 must be accompanied by a parent with proper ID to be issued a card. Individuals 16 – 18 years of age may be issued a card without a parent’s responsibility if they have their own photo ID. Otherwise, a parent is responsible until the child is 18. Lost or stolen cards can be replaced for $1.00. Items checked out on unreported lost or stolen cards are the responsibility of the cardholder. Primary Purpose: The primary purpose of the Allen County Public Library Meeting Rooms are to provide a space for library sponsored activities and programs that expand access to information and help the library fulfill its’ mission. The secondary purpose is to bring together library resources and Allen County community activities. 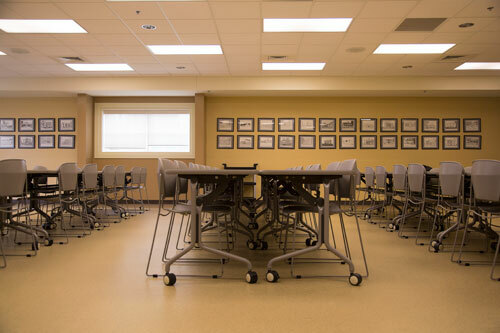 Appropriate Community Room Use: When meeting rooms are not scheduled for a library activity or program, they are available on an equitable basis to Allen County business, and/or non-profit organizations for civic , cultural, information, or educational programs or meetings. Children’s groups may use the room if they are supervised by someone over the age of 18. Programs and meetings must be free of charge. The only exception is if the attendee is paying for their meal or fees for no-profit membership or dues. Tuition for classes sponsored by an Accredited Educational Institution should be collected in advance. There may be no solicitation, promotions, or sales of items, unless sponsored by the library. Attendance may not exceed the capacity of the rooms. Groups using the meeting rooms may not distribute literature, brochures, or other materials to library customers. Smoking and alcoholic beverages are prohibited. Inappropriate Meeting Room Use. The Meeting Rooms may not be used for private social functions, religious or partisan activities, programs not consistent with the library’s mission. Meetings may not interfere with normal library operations because of noise or other factors. Available Times. The meeting scheduled in the meeting room must begin before the library closes at 7:00 p.m. No meeting will be scheduled to start at times the library is closed to the public. Equipment. Arrangements to use the library’s audiovisual equipment in the Meeting Rooms must be requested at the time the reservation is made. The library does not provide staff to operate audiovisual equipment. Storage Space. The library does not provide storage space for equipment, supplies, or personal property; therefore all personal items left in the room following the meeting will be discarded. Room Setup/Take Down: Meeting room furniture may be rearranged by the group, but the room must be returned to its original condition. Library staff do not set up or take down tables or chairs. Food and Drink: Refreshments may be served. No advance deliveries (catering) will be accepted by the library staff. The library is not responsible for supplying dishes, silverware, table covers, kitchen utensils, or dish soap, and towels. The countertop and sink must be returned to its original condition and all trash must be placed in the proper receptacles. No alcoholic beverages or gambling is allowed on library property. Smoking is not allowed in the building. Janitorial Fee. A fee of $15 per hour (minimum $15) is assessed for cleaning if the room is not returned to its original condition. Liability. The library assumes no liability for injury to people, damage to their property, or loss of property belonging to individuals or groups using the meeting rooms. Application. An application for meeting rooms use must be made in advance. The applicant who represents the group must be at least 18 years of age. The applicant is responsible for the orderly conduct of the group; in the event of damage to library property that individual is liable. The library reserves the right to deny use of the meeting rooms to any group organization that does not comply with Library Meeting Room Use policies. Schedule/Calendar. An approved application to Use the Meeting Room is required prior to reserving the room (see attached). All requests to use the Meeting Rooms are made to the library director in person or by telephone. Reservations are accepted on a first come, first served basis. They should be made at least one week prior to the meeting date. To allow the flexibility in meeting its’ own programming needs, reservations that are made more than 2 months in advance of the meeting may be changed to accommodate the libraries activities. The library reserves the right to cancel prior room reservations without prior notice if the library is unexpectedly closed due to weather or an unforeseen emergency. Publicity. The name, address or phone number of the library may not be used as the official address/headquarter of an organization. Fund-Raising. Fund-raising event are permitted only when sponsored by the Library. The library does not advocate or endorse the viewpoints of any group or individual. Meeting room use shall not be publicized in such a way as to imply library sponsorship. The holdings of the Allen County Library are made up of the following: books, periodicals, audio books and DVD’s. All are available for check out and recreational CD’s for children for in-house use only. Reference materials not for circulation and books on local history are also offered for in-library use. The library makes available to the public, by “checking out” in blocks of time, computers with on-line access as well as word processing, encyclopedia, children’s games, trip planning and various other programs. Materials will be acquired by purchase primarily in the areas of general information, instruction and reference and by a combination of purchase and lease/rental in areas of a leisure or recreational focus. Donations and gifts are accepted and encouraged, subject to the library’s gift policy. And, finally, materials are available by Inter-Library Loan in which Allen County Public Library participates as a lender and requester of books through a nation wide connectional system. The library will seek to augment the local school library holdings in the area of Accelerated Readers specifically but will not purchase textbooks, primers or other materials related to the school curriculum. Collection development concerns not only the acquisition of materials but retaining, maintaining and discarding them. Evaluation of the collection is an ongoing, continual process carried out by the staff to meet customer needs as they are made known, in the best possible format and arrangement for access to the public. Patrons who have objections to items in the collection should present these in writing to the library director with the “Citizen’s Request for Reconsideration of Library Materials” form. Materials for Allen County Public Library are selected with the purpose of carrying out our mission of providing citizens with general information for needs related to work, school and personal life. The library also provides citizens the opportunity for self-directed personal growth and development as well as resources to satisfy their needs for leisure reading experiences. The purpose of material selection is to insure that the library contains a variety of materials suitable to the many tastes, interests and reading abilities of the community and is subject to the limitations of library funds. Considerations in selection will be overall purpose, timeliness, accuracy of subject matter, readability, popular appeal, authority, format and price. Positive book reviews from professional sources, popular demand as reflected in best-seller lists and patron requests will serve as aids in selection. All library holdings are ultimately subject to the approval of the Library Board of Trustees who delegate this responsibility to the library director and staff. The choosing and placing of orders for new materials is an almost daily function of the Technical Services Librarian but is carried out in part by other staff in areas relating to their job responsibilities. All staff have input from specific patron requests and constant evaluation of available resources as they seek to meet customer needs. To maintain the best possible collection of materials, a necessary and ongoing process of culling or weeding is essential. Continual evaluation by professional staff determines books, etc., to be removed and replaced by new copies of the same material or items that supersede outdated holdings. Automation has afforded the library a ready means of determining and accessing records necessary for making these decisions. A system known as the CREW method (Continual Review, Evaluation and Weeding) will be followed. Items removed from the shelves, if still in usable condition, will be offered twice annually in a Friends of the Library book sale. Notify the complainant of the decision. The Board of Trustees does not accept responsibility for the informational and entertainment reading and needs of minors. Parents must accept responsibility for personally restricting or giving freedom to minors for any materials borrowed from or used in the library. Gifts of material for addition to the library’s collection are accepted by the library director or designated stuff. Final disposition of such materials is made with due consideration to materials selection policy, condition of material, available space, need for duplication, etc. ALL GIFTS MUST BE UNQUALIFIED. Stipulations may not be accepted. Monetary value of donations may not be made by library personnel. Gifts of money for materials in honor or memory of a person, group, or occasion will be accepted for materials to be selected within policy guidelines. Appropriate notification and thanks will be given. Book plates will be placed in materials as appropriate. Gifts of monies in excess of $500, real property, stocks and bonds, etc. will be accepted by the Board of Trustees after consideration of any stipulations or special circumstances. The library provides a variety of electronic access media, including research databases, data processing service, and Internet access. There is no charge for the use of any of these services. Patrons may print at a charge of 10 cents per page. Patrons are required to use the computers in the manner for which they are intended. Patrons must not spend excessive time on computers and will be limited to 60 minutes when others are waiting. No patron may attempt to remedy any malfunction of the computers and library staff must be notified of any problem occurring with the operation of the computers. The library assumes no responsibility for materials retrieved from any of the databases on the computers. Computer usage is provided on a “first come, first served” basis. Computer use will be in one-hour blocks of time. If no one is waiting, an additional 15 minutes will be allowed. After one hour’s use patron must relinquish access if there are patrons waiting for a computer. Uses that violate the law or encourage others to violate the law. Transmitting of offensive or harassing messages. Downloading or transmitting confidential, trade secret information, or copyrighted materials. Even if materials on the networks are not marked with the copyright symbol, users should assume that all materials are protected unless there is explicit permission on the materials to use them. Uses that cause harm to others or damage to their property. Engaging in defamation (harming another’s reputation by lies); uploading a worm, virus, “trojan horse,” “time bomb” or other harmful form of programming or vandalism; participating in “hacking” activities or any form of unauthorized access to other computers, networks, or information systems. Uses that jeopardize the security of access of the computer network or other networks on the Internet. Disclosing or sharing the user’s password with others; impersonating another user. Damaging or modifying computer equipment or software. Minors under age 17: Giving others private information about one’s self or others, including credit card numbers and social security numbers; arranging a face-to-face meeting with someone one has “met” on the computer network or Internet without a parent’s permission. Attorney General opinions, Kentucky law recognizes the confidentiality of library records. Personally identifiable information about users, including minors, will not be disclosed or used in any way, except to law enforcement authorities as provided in the law. Users should be aware, however, that due to the technical difficulties involved in providing absolute security, transactions and files could become public. The user’s access to the Library’s computer network and Internet is a privilege, not a right. A user violates this policy by his or her own action or by failing to report any violations by other users that come to the attention of the user. Further, a user violates this policy if he or she permits another to use his or her account or password to access the computer network and Internet. Failure to comply with this policy and its procedures will result in the forfeiture of the user’s right to access these computers. The mission of the Allen County Public Library is to provide for the people of Allen County an easily available local collection of and global access to the universal record of human thought, wisdom, ideals, information, experiences, and artistic expressions. Patrons may check out computers for up to one hour and may continue to use the computer longer than one hour if no patrons are waiting. However, when others patrons request computer usage and all computers have been checked out, the patron who has been on the computer the longest and has been on the computer at least one hour will be asked to disconnect. The Internet, a worldwide network of computer networks, is an essential medium for obtaining and transmitting information of all types. Therefore, public access to the Internet is germane to the Library’s mission. However, the Internet is an unregulated medium. It also provides access to information that is inaccurate, illegal or that some may find offensive or disturbing. The library will identify on its web site specific Internet sites that have potential interest for library users. But the library cannot control a user’s access to other Internet resources. The Library Board of Trustees reserves the right to amend this policy at anytime. This policy is not all-inclusive; approval of individual meeting situations not described here is determined by the Library Director. For good cause, the Library Director may waive a meeting room regulation or may deny or cancel any reservation.